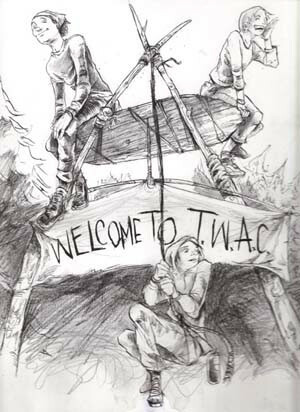 TWAC is an action camp for folks who identify as female, trans-gender, trans-sexual, gender queer and gender variant. This is an intentional space to share campaign information and direct action skills in a conscientious, supportive, empowering and encouraging environment for voices often marginalized, and then to take collective action together at the end of the camp! From the Dine’ women defending their native lands against destructive mining, to the eco-feminists defending forests from logging and developing; from the immigrant and trans women defending their lives from the prison industrial complex, to the mothers and midwifes defending their bodies and babies from the patriarchal medical establishment, women and trans folks have always been powerhouses of political action, and TWAC aims to support this in a safe(r) environment. Some campaigns and subjects that have been discussed as Florida’s possible focus (which YOU can help us shape) include Eco-defense, environmental racism, immigration, the private-prisons/deportation systems, and birth justice.